Mealtime is family time and Hispanics’ love of family is reflected in their robust spending in the food and beverage category. Hispanics’ attitudes toward food and family also impact what types and brands of products they purchase. To truly connect with the Latina shopper requires an understanding of the important role food planning and preparation play in her life. Almost half (47%) of Latinas indicate a preference for healthier foods, especially fresh fruits and vegetables despite the higher cost to obtain them vs. 40% of the total US shopper. Latinas value high quality at good prices as they need to feed larger families. Their average monthly shopping budget was a hefty $425 in 2013*. Most Latinas prefer to cook at home from scratch with 68% of Hispanics saying they cooked primarily at home last year compared to 40% of the total US shopper. And the Latina shopper will cook 20% of what she’s purchased that same day because of the perception of freshness. 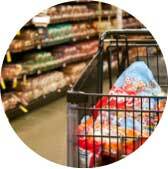 General market shoppers will more likely purchase food with a longer shelf life. With this in mind, the shopping experience cannot be underestimated. Latinas put great deal of thought into planning a shopping a trip. Meals represent much more than food — she is satisfying her family. Another interesting aspect of Latina behavior is that grocery shopping is often a collaborative experience. Shopping is naturally a group activity because Hispanics often live in a multi-generational home. Only 22% of Latinos shop alone vs. 46% of non-Hispanics. Anglo shoppers are more likely to just want to get it done while a Latina mom will spend more time and effort preparing a meal plan and an exact list of the specialized ingredients she needs. Understanding the Latina shopper’s highly organized habits and routines provides marketers with key information about how to best connect with her. Latinas makes more large stock up trips and re-fill trips than fast smaller item trips. They love their re-fill trips which comprise 37% of her shopping routine, and they re-fill more frequently than the general population due to her larger household. While value represents the strongest path to purchase, there are seasonal pulses where convenience will trump price. Holidays and back-to-school are family times where she wants to please her family and present an opportunity for retailers to leverage with promotions that will please her. In order to help drive to purchase retailers need not only be mindful of the Latina’s need for value but they also need to provide her with a positive shopping experience. A welcoming and helpful staff, an enjoyable place to shop, excellent service, access to the store and the store’s commitment to the local Hispanic community. On the value side to win her loyalty she’s looking for low prices, broad food selection, ample Latin items, a bakery and can fill of her shopping needs in one place. By staying in tune with the evolution of Latina shopping trends and moving past assumptions of the past, grocery brands can build loyalty for this powerful shopper segment.